At his new novel Inferno, Dan Brown’s protagonist Iconographer Robert Langdon reveals to Sienna Brooks – a young genius doctor- “we are in the wrong country”, and starts following the clues that would take him to Hagia Sophia to solve the secret and to save the world. Being an important world heritage, 1500 years old Hagia Sophia became the inspiration to many discussions, books, movies and films with a lot of mysteries yet still waiting to be uncovered. At the end of the novel Inferno, we will learn if Professor Langdon will be able reveal the secrets of Hagia Sophia.A part from the novel, what makes Hagia Sophia so mysterious? - Hagia Sophia is the only building in the world that served to three religions in order ; Pagan, Christian Orthodox and Sunni Islam. 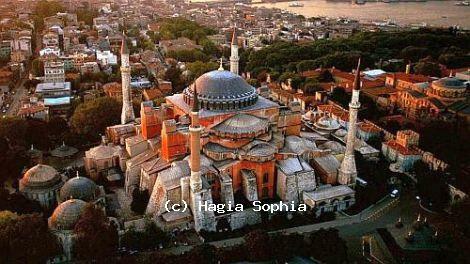 - Hagia Sophia was built by the order of the Eastern Roman emperor Justinian at the 6th century AD on top of a pagan temple. - Relics such as nails from the true cross and the shroud of Mary were some of the very important treasures of the church until the attack of the crusaders. - It is believed that the greatness of the building effected Russia in a way to choose Orthodox Christianity rather than Catholicism. - There are large cisterns under the building which is described by historians big enough for a boat to fit in. Those cisterns are also believed to connect to other cisterns located under the seat of the sultan. - It is believed that underground sections of the building like cellar, chambers or cyrpts were concealed by the priests of the church at the time of the Ottoman invasion to hide and keep the relics. - Inside Hagia Sophia, there are columns, doors, marbles and different other artifacts from earlier civilizations dating back to 5th century BC.